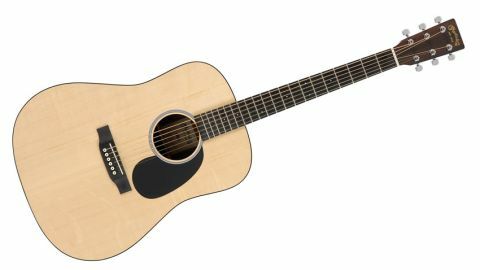 A credible mid-price take on Martin's all-conquering dreadnought. Simple aesthetic. Discreet electrics. Neck feel and profile. Not as well sorted as the D-15M. Martin Guitar, that bastion of flat-top history and tradition, has undergone something of a metamorphosis over the last two decades. Following the horrendous-for-acoustic-music 1980s, the 90s brought along with it the MTV Unplugged phenomenon, giving the Pennsylvania brand a whole new springboard into rapidly expanded waters. Today, it's in a position of great strength, boasting higher end instruments that are built better and sound better than at any time since the pre-WWII 'Golden Era'. Meanwhile, the company continues to push the envelope at the lower end, with cost-conscious guitars that use an increasing number of sustainable materials. Martin recently introduced its most cost-effective solid wood guitar to date: the mahogany-topped DRS1 as part of the Road Series. This '2' variant shares that guitar's principle spec points, including the solid sapele back and sides, though replaces the mahogany top with one of solid Sitka spruce; this particular one has some distinctive figuring across the grain that you'll either like or you won't. Underneath that, you'll find Martin's A frame X-1 bracing that is partly integral to the 'A', mortise and tenon (and bolt) neck block... which is to say it's not fastidiously scalloped X bracing and a traditionally cut and adjusted dovetail. Now, that's not actually a criticism, but it does help to explain why the higher end guitars are so much more expensive. "A point of note is an extremely sturdy Stratabond neck - a multiple lengthways laminate of wood that's impregnated with dye to make it different colours"
A point of note thereafter is an extremely sturdy Stratabond neck - a multiple lengthways laminate of wood that's impregnated with dye to make it different colours. Here, it's 'rust', which means sort of pinky red. If you're baulking at this point, then brace yourself, because: a) it feels really good to play - a kind of fast, satin surface that requires no finishing; and b) the fingerboard and belly bridge aren't 'proper' wood either. Instead they're Richlite, which is a composite material we're growing to like more and more as it appears on various Martin and indeed Gibson models. It looks and feels more like ebony than rosewood. Martin refers to the neck shape as 'modified low oval'. In the hands that translates to a comfortable middle ground of enough meat to let you know its there, but not clubby enough to upset anybody. Dare we say it's borderline unremarkable, albeit in a good way. The 42.8mm (1.69-inch) width at the nut is generally considered more comfortable for strumming, and coupled with a low-ish action, it makes for a very easy playing experience. If there's a downside, it's that Stratabond is a heavy material, resulting in slight neck heaviness in the instrument, especially when you're stood and using the strap button in the heel. Inside the soundhole is secreted a tiny control panel with two rotary pots - volume and tone - for the factory-fitted Fishman Sonitone system, fed by an under-saddle Sonicore pickup. There's a cloth nine-volt battery bag by the neck block, completing what is a very tidily built but understated guitar. "The overall impression of the DRS2's sound is of a bright guitar with a stoically new American voice"
Sapele is noted for its bright, enthusiastic tonality compared with rosewood, for example (and mahogany for that matter), and partnered with the other spec choices, the overall impression is of a bright guitar with a stoically new American voice. Good bass, sparkly trebles, a notable dip in the mids: this is a Martin dread for sure. The low action will help you bond quickly - it's lovely to pick and strum lightly - but bashers will want it a touch higher to really let those strings vibrate fully without fret noise. It lacks the punch, depth and dynamic range of the simply sublime new-version D-18 we reviewed a few months back, exactly as you'd expect, but it sounds more grown up than the firm's recently released PA5K guitars. Hands on heart, we preferred the tone of the all-mahogany D-15M but, again, it's more money. Plugged in, the DRS2 has a typical modern, good-quality piezo tonality with enough range in the tone control to be nicely mid-scooped and hi-fi sounding for strummers, or with more midrange punch for single note emphasis. You might bemoan the lack of mid-shaping bells and whistles, but the reality for a lot of occasional plugger-inners is that they (we) neither use nor understand all that stuff anyway. Just set it somewhere near the middle and let the sound engineer deal with it. No soundman? Well, you can't go far wrong with just two knobs!